For most dahlia growers, the season's still at its peak. Dahlia flowers are showing off in glorious profusion. But for some dahlia afficionados in the northern ranges of the country, the evenings are growing shorter, the nights colder, and frost is near, if not at hand. So it's time to take a look at dahlia growers' options at the end of the growing season. In their native land, and in their original wild forms, dahlias are perennials. But they originated in Mexico and Central America, where climates are temperate to warm year-round and freezing isn't an issue. In much of the United States and in Canada and Alaska, as well as in much of Europe where dahlias are also popular, they're not always likely to survive overwintering. In the cooler zones, 1-6, there's no way they'll make it through the winter; freezing will destroy the tissue of the tubers. 1. Dig and divide dahlias each fall. This is essential in zones 1-7 to be sure of dahlia survival, and even in zone 8, a hard winter freeze can penetrate deep enough into the soil to kill dahlia tubers. There are a number of advantages to this option. One is that dividing tubers will increase your dahlia supply or enable you to share favorite varieties with friends. 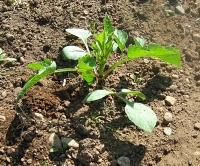 Another is that it's a good way to maintain healthy dahlia plants. Dahlias need to be divided at least every other year even if they overwinter, or the mass of tubers that develops will overwhelm itself and produce a mass of weak, spindly shoots. The disadvantage, of course, is that it takes time and effort. 2. Allow the dahlias to winter over. 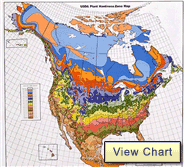 If you're in a very mild planting zone (zones 9-11) chances are this will work for you, especially if you have well-drained soil and employ some mulch for protection. One advantage, besides the fact that it's easy, is that a little tough-love Darwinian factor will figure in, and over the years your dahlia garden will feature the fittest varieties. The disadvantages are that you're likely to lose a few favorites, and that you'll still need to divide them every year or two to keep them healthy. 3. Think of your dahlias as annuals, and replace them every year as you would other annual bedding plants. 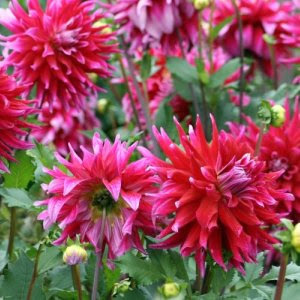 If you buy dahlia tubers, rather than ready-grown potted plants, this option is relatively affordable. The advantage of this approach is that you can try new varieties every year. Whichever option you choose, you'll find yourself in midwinter looking at dahlia catalogs and dahlia web sites and waiting for the time when you can plant your tubers or pull aside the winter mulch and start watching for the first dahlia sprout in spring.